They'll be adding extras like behind-the-scenes clips, interviews and more as time goes on. YouTube is really pushing to do something with movie rentals and the newest additions to the lineup just might help them out. The company has added hundreds of Disney and Pixar films to the lineup including big titles like 'Cars,' 'Alice in Wonderland' - the good one - and the 'Pirates of the Caribbean' films. 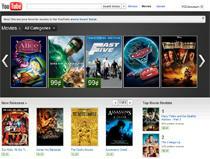 Movies range from $0.99 up to $3.99 and vary in video quality. Unfortunately, there's no way to tell what movies are available in HD before you watch them - you have to rent them to find out. The folks at YouTube say that these new additions are "the first hundreds of Walt Disney Studios movies" to hit the service, so it sounds like we can expect plenty more in the future. YouTube also says that special features are on the way.